The Impulse controllers are cost-effective, yet seem generously specified — so where's the catch? Impulse is the name of the latest USB MIDI controller keyboard range from Novation. There are three models: the Impulse 25, 49 and 61 and, as you've already guessed, the numbers refer to how many keys each model has. Beyond that, their feature sets are broadly similar. All have velocity- and aftertouch‑sensitive semi-weighted keyboards and eight backlit pads. They're programmable in the traditional sense; you can use the LCD display and associated controllers to set up key splits and layers, and assign MIDI controller messages to faders, encoders, buttons and pads. All the models offer eight endless rotary encoders and DAW transport controls, but the Impulse 49 and 61 also have a bank of nine buttons and faders (which are non‑motorised and not touch-sensitive). Around at the back, on all models, a USB socket handles the MIDI connection to your computer and is also the only power source, but there are also MIDI In and Out sockets. The rear panel also features quarter-inch jack sockets for sustain and expression pedals, and a Kensington lock slot, which will be welcomed by the education market. The Impulse's back panel features a USB port, inputs for sustain and expression pedals, and a pair of MIDI I/O sockets. From a visual point of view, these controllers are rather fetching. The white, grey and red colour scheme is a bit 1980s teenagers' bedroom, but the end-cheek fins are a contemporary-looking alternative to yet another Moog-wannabe wood imitation. The placement and spacing of controls is somehow really 'chunky', and exceptionally clear. The case appears to be 100 percent plastic, and when you pick up an Impulse it creaks and flexes a little. It feels like it'll last, though. The top and bottom keys don't protrude beyond the casework, and in use everything feels firm and well constructed. As for the keyboard itself, I've no real complaints. It's a synth-style action for sure, but the feel is positive, and there's meaningful resistance that makes playing evenly throughout the velocity range quite feasible. Four useful velocity curves are on offer, and there's an option to turn velocity off completely. Aftertouch can also be disabled — and while we're talking about aftertouch, the implementation here is not bad, but not perfect. The white keys offer an additional 3-4mm of travel beyond the keybed, and aftertouch messages are generated within that range of movement. It's a little 'on-off', but with care, smooth gradations are possible. The black keys (which, incidentally, have a very different matt texture to their white neighbours) have no such extra range of movement, though. They generate aftertouch, but you have to push harder, and there's little sense of feedback. Still, I was pleased to discover that aftertouch response remains largely the same whether you're playing chords or individual notes. That's not the case with some other controllers I've tried. Before we go on, a word about the drum pads. They're also velocity and aftertouch sensitive, and can be switched with the adjacent Roll button to generate repeated note triggers. The pads feel really good to hit with the fingers, and the aftertouch response is great — progressive and predictable. But there are two drawbacks I immediately discovered. Pads frequently don't respond when you strike their edges or corners. Taking a two-fingered approach generally gets round that, but it's not ideal. In Roll mode, I wanted to be able to hold down one pad (to get a repeated hi-hat pattern, for example) while playing other pads normally to trigger conventional drum hits. But that never really worked: the short hits only triggered intermittently. Still, I'd much rather have the pads than not. They're a useful inclusion overall. When you use Automap, the mapping of the Impulse's controls to DAW parameters is detailed in a notification window (top left) and an optional floating Mapping Editor. Multiple 'pages' of parameters are available for more complex plug-ins. Here you can also configure the Impulse's bank of faders and buttons, which are ideally suited to mixer control. A clever fader-scaling pick-up system is used to avoid abrupt jumps when physical fader positions don't match on-screen level or pan values — the next best thing to motorised faders. Novation have been quite canny with the Impulse series and provide traditional MIDI controller programming features as well as compatibility with their Automap system. I'm particularly intolerant of clumsy MIDI controller programming schemes. I've owned a few controllers in my time, and there's nothing I like less than discovering in the heat of the moment that I've forgotten how to assign a MIDI CC message to a particular control, or that some arcane LCD abbreviation is proving more of a hindrance than a help. I'm thus pleased to report that the Impulse's programming system is genuinely helpful, and should be navigable by most users without the need to refer to a manual. Which is lucky, because other than a four‑page Getting Started Guide, all other documentation for the Impulse exists in PDF form only. There's actually a simple on-board help system too although, perversely, it's labelled 'Demo'. A new feature in Automap 4, DAW configuration 'walk-throughs' are provided to assist with getting the system up and running.Let's look at my bugbear: straightforward assignment of a MIDI CC message to a control. To start with, when you just move a knob or fader, or press a button, the white-on-blue LCD shows the message type assignment (for example, 'CC# 16') and a value. To change the assignment, you press the central Controls button — nice and logical — and the display says 'MoveCtrl'. Once you've moved (or pressed) the one you want to work with, the display asks what message type should be assigned: CC, RPN, or NRPN for knobs and sliders, and MIDI notes, CC, RPN, NRPN or a Program Change message for buttons. You choose values with the main data encoder, and push it to enter them when necessary. The LCD keeps on prompting you for options, such as maximum and minimum values, button behaviour (such as toggle, or momentary), and on what channel and ports the message should be transmitted. When you've made assignments, you can save them as part of a Template. There are 20 slots, which seems a bit miserly but should be enough for most people. Fourteen of these are pre-configured from the factory, but can be overwritten. The factory presets are useful: there's a trio of general user templates, and all the rest are for specific DAWs and synths. Live, Reason, Garageband and Mainstage are included, plus various Novation hardware and software synths, and some from Native Instruments (Kontakt, FM8, B4 and Massive). Global settings include some genuinely useful features. 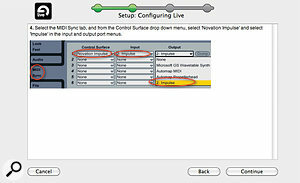 The transport controls can be switched between transmitting MIDI Machine Control and regular CC messages. And thanks to the Impulse's on-board MIDI clock (which can slave to MIDI input), there's quite a sophisticated arpeggiator with various settings affecting note playback order, octave span and rhythm. When the Impulse is in arpeggiator mode, the drum pads flash in sequence to indicate tempo and note triggers. Pressing them lets you remove or add note triggers from the basic arpeggio pattern, and so set up little rhythmic patterns. It's simple to understand, and quite funky. 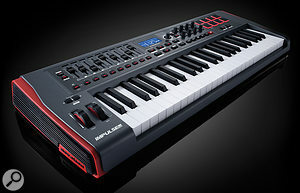 If it's Automap you're after, your only alternatives to the Impulse are other Novation models. The faderless Nocturn is cheaper, and the SL MkII, with its touch-sensitive controls, is dearer. There is an Automap competitor out there, though — M-Audio's HyperControl, which is offered with their Axiom Pro 25, 49 and 61 models. If a regular programmable controller is more your thing, lots of choice opens up. The Akai MPK range comes in 25-, 49-, 61- and 88-note sizes, and even the smallest has 12 drum pads. M-Audio's Axiom series (which is different to the Axiom Pro) also comes in 2-, 4- and 5-octave compasses. Broadly similar again are Roland's A300PRO, A500PRO and A800PRO. For some users, the whole point of buying an Impulse will be to take advantage of Automap. In case you've never heard of it before, this is a system developed by Novation that lets their MIDI controllers integrate much more fully with DAW software. The idea is that you no longer have to think about MIDI CC or any other controller assignments or, indeed, programming the Impulse in the usual way. Instead, the faders, knobs and buttons instantly adapt to control the mixer and plug-ins in your DAW as you work. 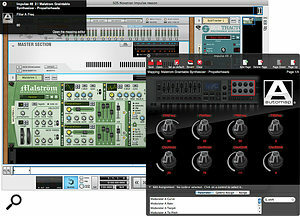 Supported plug-in formats are VST, VST3, RTAS and AU. To get going with Automap (which has now reached version 4), you have to install a software package on your Mac or Windows PC. Then you run a setup process that walks you through configuring your DAW for Automap use, which is useful, because doing so can be a bit more complex than you'd imagine. It also scans your plug-ins and quickly generates a swathe of 'wrapped' versions, which Automap can hook into to get control of them. As you work with your DAW, a background process, Automap Server, drives the whole system. From then on, you just have to remember to instantiate Automap-enabled plug-ins rather than their original counterparts. There's no question that Automap works, and can work well. Many users rave about it. My SOS reviewer colleagues have made positive reports about previous versions. Certainly, for tweaking EQ and really getting a grip on software synths in real-time, a responsive hardware controller system like this is a pleasure to work with. However, it's not without its drawbacks. It's important to realise that Automap is only at its best for officially supported DAWs. For example, Automap can control Logic and Live's proprietary plug-ins, but the same can't be said for Reaper, Digital Performer and Studio One, to name only three. Automap plug-in control will work in these and other DAWs, but only for 'normal' non-proprietary and third-party plug-ins. Then there are some specific inconsistencies and caveats. You have to remember to manually disable and subsequently re-enable in the setup application any plug-ins you update. Newly installed plug-ins have to be manually enabled too. Mac users can enable no more than 256 Audio Unit plug-ins at one time. The outcome of opening projects or songs using Automap plug-ins on other systems that don't have Automap is uncertain, and not well documented. In addition, not all plug-ins instantiate with useful mappings, in which case they can require extensive editing before use. During my testing, I came across several specific problems too. Reason may be an officially supported DAW, but in the latest Reason 6 there's no mixer control and controller mappings were haphazard. 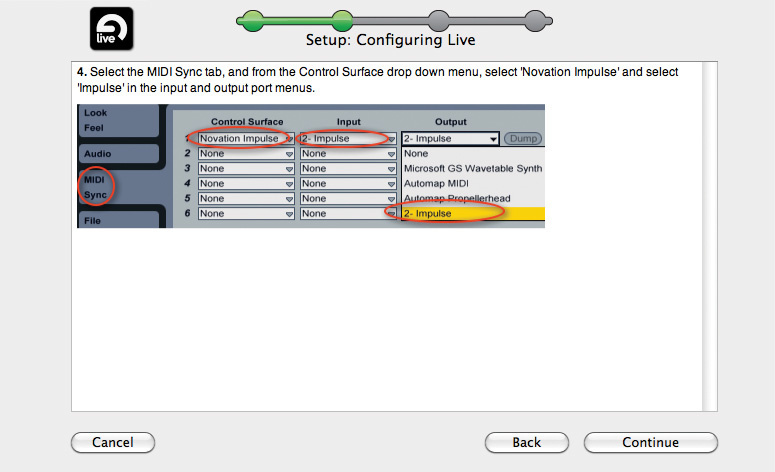 The walk-through setup process for Live was at odds with the settings actually available to me in the latest version of the application. With some experimentation, I got it working, but I could never edit mixer or parameter mapping. Next, some of the Automap versions of my Arturia synths would not see their authorisation dongle. On one occasion, none of my iLok-protected Automap plug-ins would instantiate. At these times, and others, maintaining enthusiasm for the system was a challenge. I don't want to give the impression that there are more negatives than positives. Automap is an ambitious and unique system that can work wonders. It's also controllable — you can easily exclude plug-ins from Automap control. But the price you pay for convenience and immediacy is a rather invasive installation, ongoing 'housekeeping' commitments to keep everything humming, and the risk of an extra layer of instability and incompatibility over and above usual DAW/plug-in hiccups. Mac OS 10.6.8, 10.7.2, or later. Windows: XP SP3 32 bit, or Windows 7 32/64-bit. Mac: Live, Pro Tools, Cubase, Logic, Reason. Windows: Live, Pro Tools, Cubase, Sonar, Reason. Other DAW mixers can be controlled via a Mackie HUI compatibility mode. Good provision of knobs, sliders and buttons. Aftertouch behaviour differs between black and white keys. Some minor concerns related to drum pad triggering. Automap usefulness varies according to your DAW, plug-ins and persistence, but that's not a criticism of the Impulse per se. A capable and likeable controller keyboard ideally suited to studio use with a DAW application. With Novation's Automap system offered alongside conventional programmability, there should be something here for almost everyone. Impulse 25 £199; 49 £249; 61 £299. Prices include VAT. Impulse 25 $249, 49 $349, 61 $399. American Music & Sound +1 (800) 431 2609. MacBook Pro, 2.2GHz Intel Core i7 CPU, 8GB RAM, OS 10.6.8.